Australian Broadcasting Corporation. 2001. Director: Kate Woods. CD (ST) ABC. 12092. 2001. Composed by Mario Millo.Compiled by Mario Millo & Liz Millo. Mastered by Chrlsto Curtis, Utopia Audio. Produced by Mario Millo. Assistant to Composer Cos Russo. Orchestrations & arrangements Mario Millo. Recording & Mix Engineer Christo Curtis. Conductor Christopher Gordon. Concertmaster Phillip Hartl. Orchestra Contractor Coralie Hard. Orchestra Pro Musica, Sydney. Co-ordinator Liz Millo. Orchestra recorded at Eugene Goossens Hall, ABC, Sydney, July & September, 2001. 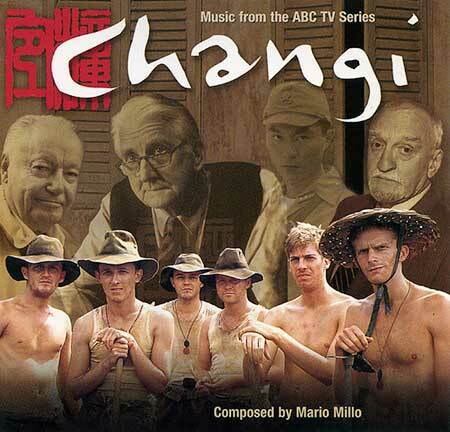 01: Changi - Opening Titles. (1:15). 02: Dave And Kate. (2:31). 03: Arriving At Changi. (1:34). 04: Gordon Remains On Box. (0:56). 05: White Cliffs Of Dover. (1:47). Mat Burton / Kent Walter (Shapiro Bernstein & Co Inc / J. Albert & Son Ply Ltd). Vocals by Mark Priestley, Matthew Written & Dean Atkinson. 06: Bill And Betty. (2:22). 09: I Only Have Eyes For You. (1:25). Al Dubin / Harry Warren (Remick Music Corporation / J. Albert & Son Pty Ltd). Vocals by Mark Priestley, Backing vocals by Mario Millo. 10: Eddie Hits Target. (0:45). 11: Dave Recalls Concussion. (1:16). 12: Eddy At Mother's Deathbed. (1:21). 13: Lofty Lies Dead. (0:43). 14: VI Romances Curly. (1:20). 15: Top Hat, White Tie And Tails. (2:14). Irving Berlin (Irving Berlin Music Corp / Warner/Chappell Music Ltd). Vocals by Anthony Hayes. Backing vocals by Mario Millo, Jeff Camilleri & Jerry van der Slot. Saxaphone, Clarinet - Mark Taylor. Drums - Robbie Siracusa, Double Bass - Emile Nelson. 16: Caught In Light And Time. (0:57). 17: Disbelief In Lofty's Death. (1:17). 18: Curly What Have You Done. (1:18). 19: I'll See You Again. (1:38). Noel Coward (Chappell Music Ltd /Warner/Chappell Music Ltd). Vocals by Dean Atkinson. 20: Dave Will Go To Reunion. (0:55). 21: Eddy's Mother's Last Words. (1:44). 23: Bye, Bye Blackbird. (1:04). Ray Henderson / Mort Dixon (Redwood Music Ltd / J. Albert & Son Pty Ltd). Vocals by Jerry van der Slot. 24: Young Curly Hides. (2:38). 25: Old Gordon Has A Stroke. (2:06). 26: Happy Birthday Eddy. (1:11). 27: Bill And Betty Say Goodbye. (1:32). 28: Danny Boy. (1:38). Arr. Mario Millo (ABC Music Publishing). Vocals by Jeff Camilleri. Backing vocals by Mario Millo, Jeff Camilleri & Jerry van der Slot. 29: Side By Side. (1:07). Harry Woods (Shapiro Bernstein & Co Inc / J. Albert & Son Pty Ltd). Vocals by Mark Priestley & Anthony Hayes. 30: Nakamura Arrives At Changi. (0:58). 31: Tanaka Kills Lofty. (1:35). 32: Curly In Trauma. (1:48). 33: Tom In Shock. (0:48). 35: I'll Be Seeing You. (1:44). Sammy Fain Irving Karel (1938 Williamson Music International / EMI Music Publishing Ltd). Vocals by Jerry van der Slot. 36: Rowdy's Spark Of Joy. (1:43). 37: Soldier Of The Emperor. (1:18). 38: The Last Night. (2:49). 39: Over The Rainbow. (2:02). Harold Arlen / E Y Harburg (1939 EMI Feist Catalog Inc/ EMI Catalogue Partnership Australia Pty Ltd). Vocals by Matthew Whittet & Claire Farrugia, Soprano. 40: Dave Goes To War. (1:31). 43: We'll Meet Again. (1:33). Hugh Charles / Ross Parker (1939 Dash Music Co Ltd / Allans Music Australia Pty. Ltd/ EMI Music Publishing Australia Pty Ltd). Vocals by St Andrews Cathedral School Treble Choir & Claire Farrugla Soprano Boys Choir - Christopher Pearson, Nicholas Pearson, Samuel Brewer, Elliot Taylor, Alexandre Thompson, Philippe Thompson, David Cole, Joshua Stephenson-Roberts, Jeremy Bali Michael Ford, David Phibbs, Samuel Milgate, David MacCue. Choirmaster - Chris Belshaw. 44: Chang! - Closing Titles. (1:32). 45: Nevertheless I'm In Love With You. (2:09). Harry Ruby / Bert Kalmar (Redwood Music Ltd / J. Albert & Son Pty Ltd / Memory Lane Music Ltd). Vocals by Mark Priestley & Anthony Hayes. Saxaphone, Clarinet - Mark Taylor. Drums - Robbie Siracusa. Double Bass - Emile Nelson. CD(t) (ST)	(See COMPILATIONS - ABC TV THEMES: CD1-Tk18).